Preschoolers will have a blast learning to read with all their Clubhouse friends in this new early reader! 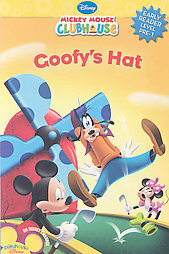 When Goofy loses his special hat, he just doesn't feel very "Goofy" anymore. Join the Sensational Six as they take on the quest to find the missing hat, and help Goofy regain his confidence. 这本书讲的是Goofy丢失了他的帽子, 找啊找啊, 最后找到的时候, 发现帽子自己在一跳一跳的, 原来里面有一只青蛙. 看到这里, 我们两个一起哈哈大笑起来. 文字不难,适合初学者亲子阅读.